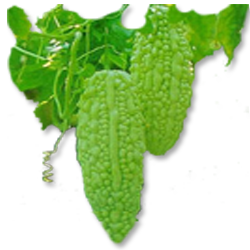 Bitter gourd (Momordica charantia) is one of the most popular vegetables in Kerala. The fruits are used in a variety of culinary preparations and possess high nutritive and medicinal value. The fruits are rich in vitamin C and folate, and contain alkaloids likely momordicine, saponine and albuminoides, which are medicinally important. Juice extracted by crushing bitter gourd fruits is most commonly used for treatment of diabetes. Bitter gourd can be cultivated from lowland to altitudes up to 1,000 m. It requires a minimum temperature of 180C during early growth, but optimal temperatures are in the range of 24–270C. The crop can tolerate low temperatures, but extreme cool temperatures will retard growth. The plants are adapted to a wide variety of rainfall conditions. Bitter gourd tolerates a wide range of soil but prefers a well drained sandy loam soil rich in organic matter. The optimum soil pH is 6.0–6.7, but plants tolerate alkaline soils up to pH 8.0. Priya: High yielding variety released from the Kerala Agricultural University. Fruits are long and green with the distal end being greenish white in colour. Average yield is 30 t/ha. Preethi: High yielding variety released from the Kerala Agricultural University. Medium sized greenish white fruits. Average yield is 10-35 t/ha. Relatively less susceptible to fruit fly attack. Suitable for growing in Thrissur, Palakkad and Ernakulam districts. Priyanka: High yielding variety released from the Kerala Agricultural University. Fruits are greenish white in colour. Average yield is 29 t/ha. Resistant to powdery mildew disease. Priyanka is recommended for acid alluvial soils of Kerala. Arka Harit: High yielding variety released from the Indian Institute of Horticultural Research, Bangalore. Stem is thin and with light green, deeply lobed foliage. Fruits are spindle shaped, skin is glossy green, and without tubercles. Duration is 100-110 days. Average yield is 12 t/ha. The choice of variety should be according to market preference based on fruit shape and color. Select a variety that is well adapted to the local growing conditions and preferred by consumers. Approximately 5.0-6.0 kg of seeds are required for cultivating one hectare of land.Soaking seeds in 1:10 solution of 100 ppm Potassium Nitrate for 3 hrs increases germination and seedling vigour. January-March and September-December are the ideal seasons for growing bitter gourd. For the rainfed crop, sowing can be started after the receipt of first few showers during May-June. Prepare the soil to a fine tilth by ploughing and harrowing. Pits of 60 cm diameter and 30-45 cm depth are taken at a spacing of 2m x 2m. Well rotten FYM and fertilizers are mixed with topsoil in the pit. The seeds are soaked in water for 24 hours prior to planting for better and quicker germination. Soaking seeds in a solution of bavistin @ 0.2 % for 6 hours and drying in shade before sowing is also recommended to reduce the attack of soil born fungus. As seedlings require ample water for quicker germination, giving a presowing irrigation 3-4 days before sowing is beneficial. Sow four or five seeds in a pit at 1-2 cm depth. Deeper sowing delays germination. Irrigate with a rose can daily. The seeds will germinate in about 4-5 days. Unhealthy plants are removed after two weeks and retain only three plants per pit. In high range zone, seedlings can be raised in greenhouses to ensure good germination and are later transplanted to the main field. Sow two or three seeds in small plastic pots/containers filled with potting mixture. Thin to a single seedling at four to six leaf stage. Water the seedlings thoroughly every morn­ing. Seedlings will be ready for transplanting 15-20 days after sowing or when they are 10-15 cm tall. Transplant seedlings into the field at spacings simi­lar to those used for the direct seeding method. 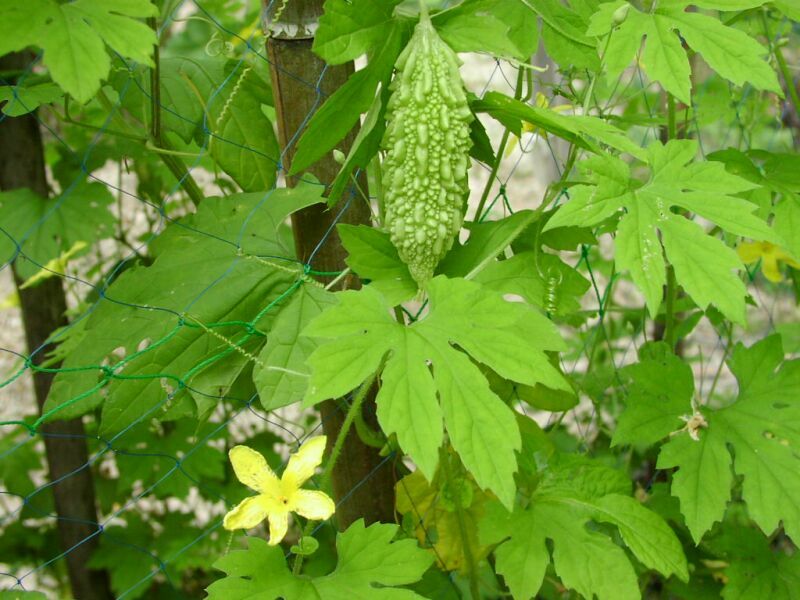 Bitter gourd grows very fast and vines elongate rapidly within two weeks after planting. Thereafter, the plant sends out lateral stems. Staking and trel­lising will increase fruit yield and size, reduce fruit rot, and make spraying and harvesting easier. Pandals are the most common trellising system used in Kerala. For this, pandals of 1.5 m height are erected using bamboo poles, wooden stakes, GI pipes or other sturdy materials when the plants start vining. Steel wires/strings, preferably coated with rust proof materials like plastic are used to connect the stakes, and to which coir or plastic ropes are tied in a crisscross manner so that horizontal coir/plastic ropes run across on the top forming a net. Vines are supported by bamboo stakes, which help vines freely climb and reach the top. Other improved methods of trellising are also available. The trellis can be arranged either in a lean-to or tunnel structure. For the lean-to type, the stakes are joined be­tween two adjoining beds forming an A shape struc­ture. Horizontal stakes are installed at the top joining all other beds. The stakes support the climbing vines and lateral stems. Strings are used to secure adjoining stakes. The trellis should be 1.8-2.0 m high, constructed from stakes 1.2-1.8 m apart. For the tunnel type, plants are grown inside an arch shape structure made of either PVC or galva­nized iron pipe. Plants are supported by bamboo stakes where vines freely climb and reach the top, which will then grow along the structure. Bitter gourd develops many side branches that are not productive. To improve yield, remove lateral branches until the runner reaches the top of the trellis. Leave 4-6 laterals and cut the tip of the main runner to induce early cropping. Removal of lat­eral branches in the first 10 nodes has a positive effect on total yield. Where consumers want their bitter gourd straight rather than curved, tie a pebble at the end of a long piece of string to the flower end to weigh down the fruit and keep it from curl­ing. Balanced fertilization is essential for high yielding and good keeping quality of the fruits. Fertilizer dosage depends on soil type, fertility level, and soil organic matter. Apply FYM @ 20-25 t/ha as basal dose along with half dose of N (35 kg) and full dose of P2O5 (25 kg) and K2O (25 kg/ha). The remaining dose of N (35 kg) can be applied in two equal split . A fertilizer dose of 70:25:25 kg N:P2O5:K2O / ha in several splits is recommended in Onattukara region. The fertilizer dose per pit would be 28:10:10 g N:P2O5:K2O. Bitter gourds do not tolerate drought. Maintain good soil moisture in the upper 50 cm of soil where the majority of roots are located. During the initial stages of growth, irrigate at 3-4 days interval, and alternate days during flowering/fruiting. Furrow irrigation is the ideal method of irrigating. But in high tech agriculture, water use efficiency can be improved by using trickle or drip irrigation. During rainy season, drainage is essential for plant survival and growth. Irrigation at 15 mm CPE (app at 3 days interval for sandy loam soils) are more economical than irrigating once in 2 days especially during summer months for water economy. In bitter gourd, male and female flowers are borne separately on the same plant, and male flowers normally exceed the females by about 25:1. Spraying vines with flowering hormones after they have six to eight true leaves will increase the number of female flowers and can double the num­ber of fruits. For example, one application of gibberellic acid at 25-100 ppm increases female flow­ers by 50 % and can work for up to 80 days. Application of ethrel (an ethylene releasing compound) has been found to increase femaleness in bitter gourd. Bitter gourd is a cross pollinated crop. Insects, especially bees, pollinate flowers. Pollination can be a problem dur­ing the wet season since bees are less active dur­ing overcast conditions. Intro­duction of beehives ensure good pollination and avoid the need for hand pollination. Conduct weeding and raking of the soil at the time of fertilizer application. Earthing up is done during rainy season. Hand or hoe weeding can be performed as needed. Mulching is commonly used for bitter gourd crops grown on raised beds. Use organic or plastic mulch depending on availability. Mulch can be laid down before or after trans­planting and after sowing. For controlling pests of bitter gourd, go for mechanical and biological control methods. Chemical control of insect pests should be done only when significant damage occurs. Avoid pesti­cides that kill or inhibit the development of benefi­cial organisms especially the pollinators. Choose pesticides that last only a few days. Fruit fly is the most destructive insect pest of bitter gourd. Fruit fly maggots feed on the internal tissues of the fruit causing premature fruit drop and also yellowing and rotting of the affected fruits. This fly is difficult to control because its maggots feed inside the fruits, protected from direct contact with insecticides. Control: . In homestead gardens, covering the fruits in polythene/paper covers help to prevent flies from laying eggs inside the fruits. In large gardens apply malathion 0.15 % suspension containing sugar or jaggery @ 10 g/litre at fortnightly intervals at flowering and fruit initiation. It can also be effectively controlled by the use of banana fruit traps.Spray as coarse droplets on the ventral leaves. Remove and destroy affected and decayed fruits. It can also be effectively controlled by the use of banana fruit traps coupled with the removal and destruction of infected fruits. It is more efficient than two sprayings with insecticide. Traps at 2 m distance after a border row, replenished after 7 to 9 days. Start bait trapping before flowering. Control: Remove and destroy egg masses, grubs and adults occurring on leaves. Adult beetles eat the leaves, makes hole on foliage and causes damage on roots and leaves. Grubs cause damage by feeding on root. It also feeds on flowers and bores into developing fruits. Control: Spray 2% talc based formulation of Beauvaria bassiana + 0.1% teepol at fortnightly intervals for the management of pumpkin caterpillars, leaf footed bugs and plant lice. Control: Apply 1.5% fish oil soap. First dissolve soap in hot water and then make up the volume. Control: Complete removal and destruction of the affected leaves. Spraying 10 % solution of neem or kiriyath preparation. If the disease incidence is severe, spraying indofil M-45 0.2%, akomin 0.3 % or mancozeb 0.2 % will be useful. Foliar spraying of combination fungicide Cymoxanil + Mancozeb 2 g/l or 2 sprayings of Pseudomonas fluorescence 2% (20 g/l) thrice at fortnightly interval on the appearance of the symptom. Control: Control the disease by spraying Dinocap 1 ml/ litre or Trichoderma viridae 2 g/l or neem oil 2% or 3 foliar sprays at 14 days interval on symptom appearance. Bitter gourd requires close attention at harvest time and fruits must be harvested frequently. Normally, it takes 15-20 days after fruit set or 90 days from planting for fruit to reach marketable age, however, fruits can be harvested at earlier stages depending on the purpose for which it will be used. Ideally, at harvest fruits should be light green, thick and juicy, and the seeds should be soft and white. Harvest every 2-3 days using a pair of scissors or a sharp knife to cut the fruit stalk. If a fruit remains too long on the vine, it will turn spongy, sour, yellow or orange, and split open. Yield varies depending on vari­ety and management. Average marketable yields are 15-20 t/ha, and some hybrids yield up to 40 t/ha. The harvested fruits do not keep long and should be sold in the market immediately. Remove dam­aged and deformed fruits. Carefully arrange fruits in bamboo baskets or boxes and store in a cool place at 12-13°C with 85-90 % relative hu­midity. Under this condition, fruit storage life can be extended 2-3 weeks. Bitter gourd is chilling sen­sitive and damage may occur if kept below 10°C. Do not store fruits at temperatures above 13°C, as this will result in fruits turning yellow and splitting open. Keep harvested fruits away from other fruits (such as banana, pineapple and apple) that release large amounts of ethylene, a ripening hormone. Collection and destruction of fallen fruits, setting up of pheromone traps(cuelure) at one trap per 15 cents, banana jaggery food bait 100 ml (200 g banana + 10 g jiggery+ 0.2 ml malathion) mashed in 100 ml water, kept in plastic bottles with 3 holes; at one per 8 plants. Also, spot application of 10% jaggery containing 0.1% malathion @ 1 spot/ 40 m2 on underside of leaves at fortnightly intervals during fruiting season and application of Beauveria bassiana @ 10 litres / 40 m2 (containing 20g formulation /litre) in soil during fruiting season is recommended.